Contemporary glass inset desktop perfect for laptop or screen. Smoked black glass inset with Anthracite thermofoil surface; white backed clear glass with Medium Cherry thermofoil surface. Sleek steel cross leg design; metallic-gray powder coated finish. 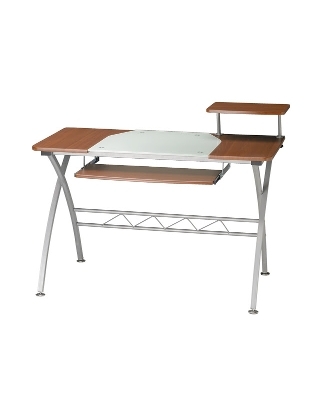 Top accessory shelf – can locate on the left or right side of the desk top. Slide-out keyboard tray: 24"W x 11 3/4"D at center; 10 1/2"D at ends.